Relations diagrams are primarily used where there are very complex relationships and problems that need to be solved or there are very complex and intertwined points that require in-depth analysis. However, they are also quite adaptable and flexible, so they can be used in less demanding circumstances as a means of analysing the potential impact of any specific course of action. In essence, the relations diagram is a way of showing the relationship between these various points or issues and showing how they all interact with each other. To put it in crude terms, it is like a family tree, with the different relationships all set out, but with the relations diagram, they will interlink more than within any line of ancestry. Arrows are used to indicate whether an issue is a root cause, a bottleneck or a key cause. Where there are arrows pointing from (and not into a box) then it is a root cause. A bottleneck has a lot of arrows flowing into it. Where there is a key cause, with arrows coming in and out, further action is required. So for example, in the example below (excerpted from Nancy R. Tague’s ‘The Quality Toolbox’, 2nd Edition, ASQ Quality Press, 2004. It can be seen that the increased processing cost (with incoming arrows) is a bottleneck, Computer replacement project is the root cause and the install new framework is a key cause that requires something to be done. 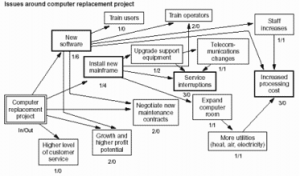 The example above is a standard ‘cause and effect’ relations diagram showing basically the different causes and effects that the action of the computer replacement project will have. Within the world of relations diagrams there are broadly two different types of diagrams. The first type represent organisational or mainly static features relating to a given situation. The second type of relations diagrams are not static in the sense that they occur over time. The most common form of these are the flow charts, which show how time will impact on the various issues and there is no static form to these diagrams. Thus a ‘relations diagram’ can take a number of forms and may even be depicted as a decision tree, but ultimately the form is irrelevant, the basic form of the diagram is the relations diagram. Different types of relations diagrams can be used to solve complex problems. So where there is a need to analyse the cause and effect of a certain course of action, then the obvious quality tool would be to use a cause and effect relations diagram. Where the problem involves looking at the potential long term effect of a certain course of action, projecting some time into the future, then a more appropriate diagram would be a flow chart, enabling analysis and appraisals of current actions in terms of the future impact. One of the most appealing aspects of the relations diagram is that it does not need to be complex. If the situation is not in itself complex, then a very basic diagram can be used. Conversely, if it is a very problematic and complex problem, then the diagram can be as intricate as required. This flexibility means that the diagram can be added to as and when required. Thus the analysis can be ongoing. Within any scenario there are always unknowns, so when these happen, these can be added to the existing diagram and then the impact can be continuously assessed. This flexibility is critical in terms of keeping abreast of changes or variances within assumed ‘givens’ which may not actually happen.